This entry was posted in Uncategorized and tagged baking, cake, cooking, food, Mochi, Mochi Cake by christao408. Bookmark the permalink. I like Japanese Mochi cakes. Even though I hate that glutinous rice, the cake look really good. 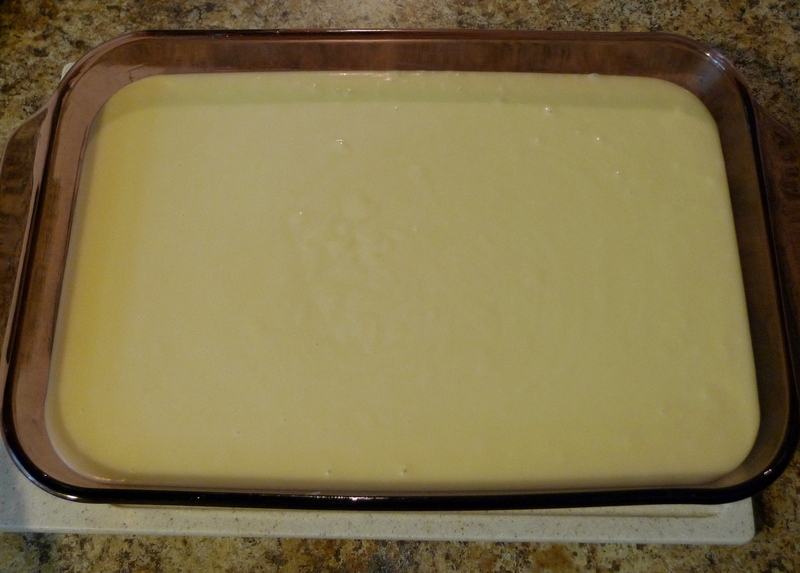 I love mochi – I bet I’d like the cake… I think I can find all the ingredients except the flour. Looks like another item for the “Going to Chicago” shopping list. 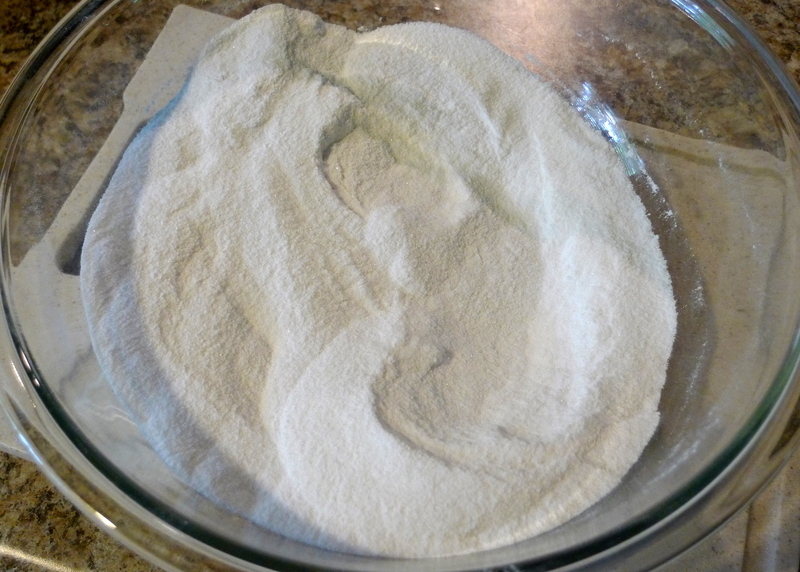 @murisopsis – If there is any Asian market nearby, you should be able to find the flour. In Asian markets it is very common. 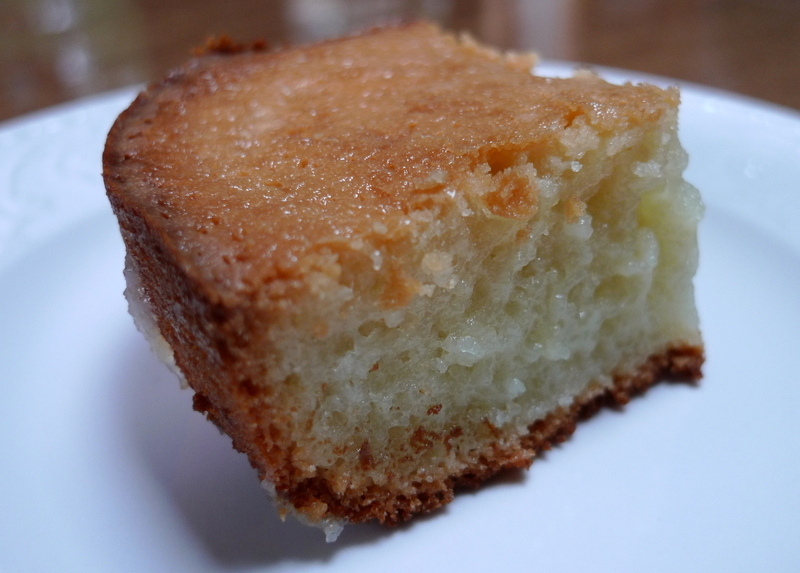 @amygwen – It crosses the line between sticky rice and cake pretty nicely, owing more to pound cake than anything else. @foggysunnymorning – Then this is the cake for you! @slmret – Glad you enjoyed it. those eggs are so white! are they the expensive kind?i bought my first dozen free-range eggs the other day – i really think it tastes better, plus i feel better thinking about the happier chickens. That looks delicious as usual. :I Thanks for showing the step-by-step instructions! 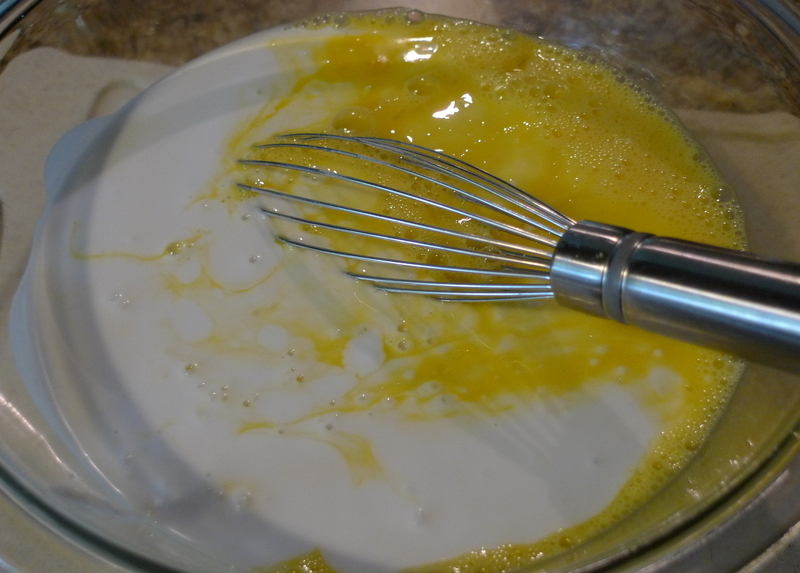 It looks quite easy… I’m tempted to try it, but coconut milk and butter have soooo much saturated fat. Maybe I’ll try making it and giving it away.How much does the Mochiko cost? When you say you’d put fresh fruit on it, do you mean literally putting fresh fruit slices on it, or were you thinking of making some sort of glaze/frosting? @Sinful_Sundae – Of course. Welcome. Any friend of Andy’s is a friend of mine. @stepaside_loser – These were whatever standard supermarket eggs were in my sister’s refrigerator. 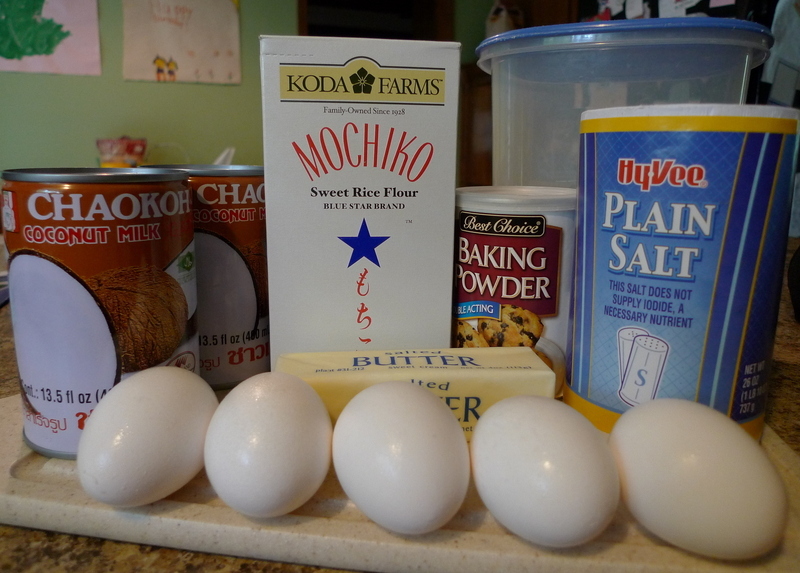 I wrote an entry a while back about my experience with free-range eggs: http://christao408.xanga.com/687922386/breakfast/@Senlin – Mochiko was cheap, maybe $4 a box. Regarding the fruit, I’d be inclined to just slice fresh fruit into the bowl, maybe add just a wee bit of sugar to get the juices flowing, and then spoon it over slices of the cake. Don’t worry so much about the saturated fat. This is something you’re just eating a little bit of. Serve it at a party or work funtion, or cut the recipe in half. @Toro69 – Gosh, I bet she’d enjoy this mochi cake if she liked daifuku. So that’s the mochi you’ve been talking about! Looks delicious and moist! i love mochi cake and get it at the phillipino take out in riverside. in fact i love sticky rice anyway i can get it. my friend makes it with carrots and potatoes in it like a hot dish. such a shame you are only changing planes in los angeles as i live just an hour from the airport and would be fun to meet you in person . next time you come this way we should make an appointment to meet. unfortuneately i have to work the rest of the week. survey is over and i have to help with the clean up, corrections etc. You have introduced to me a very new cake Chris. I hope I can find the flour in our grocery stores. Yes I would like to try it. Thank you. @grannykaren – It is interesting how mochi and other forms of sticky rice are prevalant across various Asian cultures. @ZSA_MD – I’m certain that if you can’t find it in Quincy (do you have an Asian specialty market?) then you can most certainly find it in St. Louis. @CurryPuffy – That’s the mochi I’ve been talking about. Mmmmm. Is this gluten free or am I imagining things? @christao408 – Yes I am sure I will find it at the Global Foods in St. Louis. @wereallylikefood – No flour, just rice flour, so it is gluten free. (looks confused at amygwen) I think we file this under the tastes better than it looks category I’m sure. I’m reminded of my gran’s hot milk cake which always tasted fabulous but left much to the eye, and, I always thought, would do better buried under a 4cm layer of butter cream icing. Agh!!! Mochi cake! I gotta try this recipe! Before I even read the last paragraph and saw the pic I thought “that would be great with some strawberries, strawberry syrup and whipped cream”! @brooklyn2028 – That would be a very good topping. Now, I remade this recipe last night here in Bangkok and it turned out much denser. Not sure why. But some slices of mango on top more than made up for it. I have had some of these while I was in Japan. So, i was looking online for a recipe and thankfully I came across your wonderful site. Thank you for sharing this to us as I made it and it was perfect. My kids loved it too! Kudos to you! @Best%20coffee%20maker – I’m glad you found the recipe. The original recipe I link to in this entry – Week of Menus – also has several variations on the recipe that you might enjoy.